Centre Fellow-elect, Dr Kay Peggs has published a new book on animals and sociology designed as an introduction to the field. Animals and Sociology challenges traditional assumptions about the very nature of sociology. Sociology often centres on humans; however, other animals are everywhere in society. Humans eat the flesh of other animals and wear their skins and hair as clothing. Other animals live with humans in their homes and work for humans in a myriad of ways. Human entertainment is often serviced by the capture and performances of other animals and human speech often invokes other animal metaphors. Dr Peggs, who is Principal Lecturer in Sociology at the University of Portsmouth, investigates these relationships with other animals, and many more, using sociological theories and perspectives. In doing so, she explores the significant contribution that sociology can make to our understanding of human relations with other animals and the important contribution that the study of other animals in society can make to sociology. In conclusion, she considers the role of sociology for other animals. 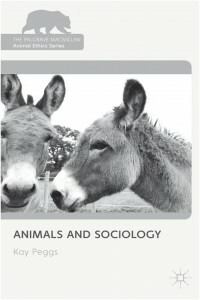 Animals and Sociology is the most recent publication in the Palgrave Macmillan Series on Animal Ethics. The Series is produced in partnership with the Centre and aims to provide a range of key introductory and advanced texts that map out ethical positions on animal issues. The book is available at £60.00 hardback, £19.99 paperback, and as an electronic book text for £60.00.